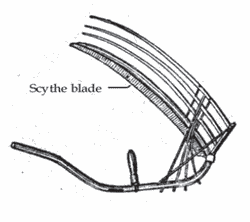 A scythe with an attached light wooden frame parallel with and rising perhaps two feet above the blade. The Cradle’s purpose was to collect the grain stalks into bundles as they were cut, and thus make it easier and quicker to Shock the stalks. The concept of a cradle attached to a scythe dates back many centuries, and its versatility in small rough fields is demonstrated by the fact that it continued to be used in a small way in some parts of the U.S. until World War II. The next summer Uncle Chuck started out to harvest the crop with a cradle scythe that was already on the farm. A cradle scythe c1800 from the Southwestern Ontario Heritage Village was used by Jacob Arner on his farm in Gosfield Township, Essex County. Sickles, scythes and cradle scythes were the implements of choice for cutting hay and grain, but these hand tools were slow and required lots of manpower.